The Transportation Team initiates projects which create an efficient post transit network and reduce emissions for cleaner air. These projects include the Sustainable Shuttle system, an alternative fueling station, an alternative transportation plan for cyclists and pedestrians and electric vehicles. Fort Bragg also encourages carpooling! To reduce emissions (and save fuel in your vehicle), Fort Bragg supports a no-idle policy. Please … turn off your ignition when your vehicle is in park. Ensure that your tires are properly inflated. Ensure that your gas cap fits properly. Fuel your vehicle early in the morning or early in the evening to reduce gasoline evaporation. Remove the junk from your trunk. Excess weight in your vehicle diminishes gas mileage. Chain your trips and errands to reduce fuel consumption. Avoid aggressive driving, idling, speeding, hard braking and rapid acceleration. Use cruise control on the highway. Choose a more fuel efficient vehicle. Consider hybrid and electric vehicles. Why hassle with Fort Bragg traffic, consume gas in your POV and lose that sweet parking space you scored this morning? Let the Sustainable Shuttle do the driving! The Shuttle stops at many destinations on post including dining facilities, restaurants, retail centers, physical fitness centers, barracks, administrative centers, Womack Army Medical Center, the Soldier Support Center, clinics and more! The Shuttle also connects to the Fayetteville Area System of Transit (FAST) to link Fort Bragg to the city of Fayetteville, North Carolina’s 5th largest metropolitan area, and regional attractions. 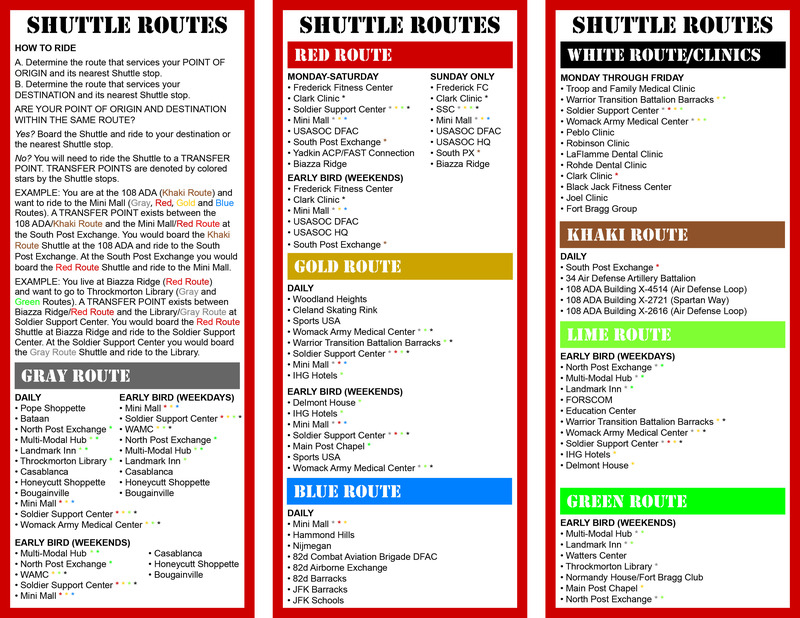 Visit the Installation Transportation Office for the latest Shuttle schedules. Or, call 396.1992. For General Services Administration fleet vehicles that operate on alternative fuels, the Alternative Fueling Station is a one-stop fueling point for E85 Ethanol and B20 biodiesel. The AFS also offers Ultra-Low Sulfur Diesel for non-tactical emergency vehicles. The reduction of petroleum consumption from the AFS is projected at 405,000 gallons annually. Carbon dioxide emissions savings is projected at 4,000 tons annually. The AFS is located at the corner of Longstreet Road and Gruber Road. To obtain a VILKey to operate the AFS, contact the Installation Transportation Office at 396.1919. Currently, there are no facilities on Fort Bragg that offer alternative fuels for personally owned vehicles. Any inquiries should be directed to AAFES. With a complete departure from the 20th century automobile centric sprawl design standard, the Fort Bragg Alternative Transportation Plan identifies an expansion of the shuttle system as well as the development of routes and corridors designated primarily for bicycle and pedestrian transportation. When fully implemented, travelers may commence and end their journeys on the installation with no need for a personal automobile. Fort Bragg has numerous hybrid and Flex Fuel vehicles in its GSA fleet. The installation is also in the process of adding all-electric vehicles to the GSA fleet and developing infrastructure for personal electric vehicles. Looks like some in the NCR are starting to move on it. Thank you for your comment! The Installation has a $46.8 million dollar energy bill which must, by regulation, reduce agency building energy intensity measured in British thermal units (BTUs) per gross square foot by 2.5 percent annually. While the federal transportation fleets must improve agency fleet and vehicle efficiency and management by taking actions that reduce fleet-wide per-mile greenhouse gas emissions from agency fleet vehicles (also by regulation) the installation of EV charging stations has not been incorporated yet due to many factors. Discussions are underway, but no course of action has been decided at this time. 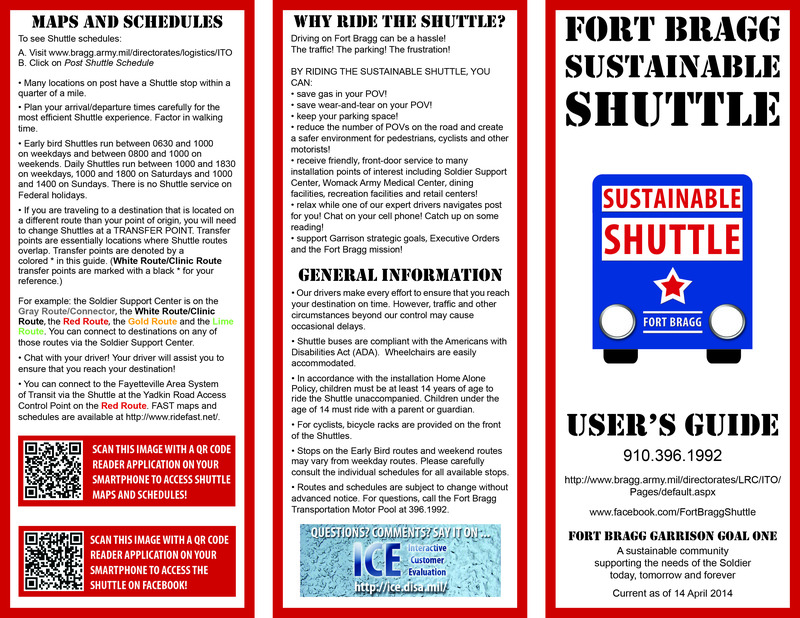 Thank you for contacting Sustainable Fort Bragg! If we have a plug-in car, are we authorized to plug it in to charge during the duty/work day? Per Army guidance, no charging of POVs is permitted utilizing Government resources. Should any charging stations become available where you pay as you charge in the future, we will publish that information! Thank you for asking. It is common practice for employees on Ft Bragg to plug their cell phones in while at work, but no solution for EV drivers? Where is the line drawn? I guess somewhere between a cell phone and a car. Actually, employees should not be plugging in their phones or other non-mission related equipment at work for charging. This is on an honor system and Fort Bragg does not have resources to go building to building to inspect. The Installation has a $46.8 million dollar energy bill which must, by regulation, reduce agency building energy intensity measured in British thermal units (BTUs) per gross square foot by 2.5 percent annually. While the federal transportation fleets must improve agency fleet and vehicle efficiency and management by taking actions that reduce fleet-wide per-mile greenhouse gas emissions from agency fleet vehicles (also by regulation) the installation of EV charging stations has not been incorporated yet due to many factors. Discussions are underway, but no course of action has been decided at this time. We are putting together a statewide radio and TV public education campaign focused on clean transportation solutions and would love to feature a Fort Bragg soldier that drives an electric vehicle or fuels with E85 or biodiesel. Can you help us ? Are there any existing public electric car charging stations available on Fort Bragg? There are no public electric charging stations available on Fort Bragg at this time. If any should become available, we will be sure to get the word out! Thank you for asking. We are not aware of any plans for electric car charging stations at WAMC or anywhere else on Fort Bragg at this time. There are many patients and employees at the hospital that would benefit from EV charging. Outside of WAMC.